Ballinlea oil/gas well – not a ‘done deal’. The company has had to supply more information, and more time has been allowed for objections. 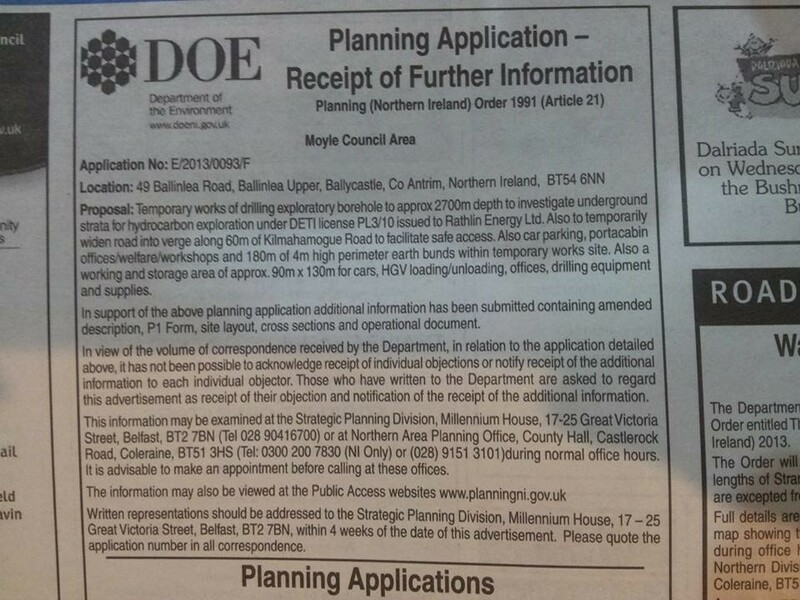 The planning application to drill an exploratory well at Ballinlea in Co. Antrim is no ordinary application. It has received extraordinary attention from the public – around 1000 of whom have sent in objections to the Planning authorities. Now there is a new opportunity to send new objections – until 26th September. The application has been advertised again in a special notice (see below). Rathlin Energy, the company wanting to drill down to explore the shale layer at Ballinlea, has provided (upon request) much more detail about their planned operation. They have now provided a detailed operational plan, setting out how the site would be modified, details about the number of trucks that would be required and a list of the chemicals they plan to use, with safety information about each one. All of the new information is available on the planning website, under ‘additional documentation’. The public have 4 weeks from the date of publication to lodge new objections – that means people have until 26th September to look at the new plans and details and lodge new objections. We would urge everyone to look carefully at these new plans to see the reality of what is being proposed – and consider what you can do to help stop this from happening, and spreading across the entire north coast area. You have probably seen the TV footage of the Balcombe villagers and their supporters rejecting similar exploratory drilling in Sussex. What will you do to protect your north coast from contamination and devastating industrialisation? Join the concerned Ballinlea Residents on facebook and keep up to date.